I think it is a mistake that the APM is not a bi-directional full loop. With the BL and Economy Parking always at a tail end, Terminals A and B are highly disadvantaged in transit and cheap parking access. And Terminal E is disadvantaged for rental car access. 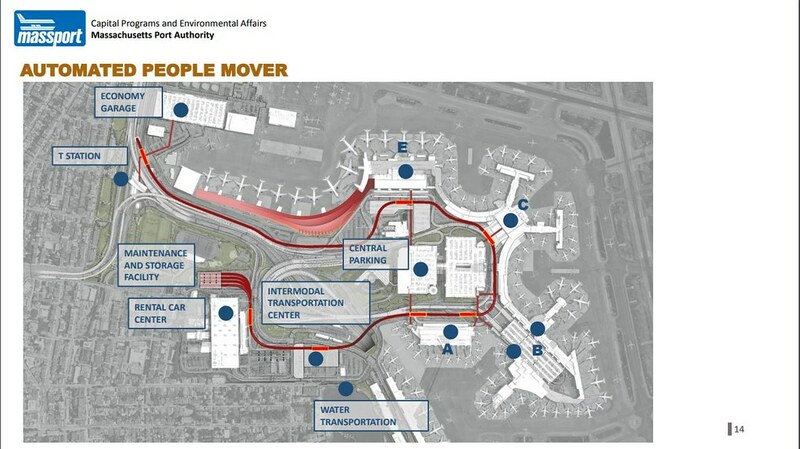 APM in a full loop with vehicles running in both directions make a lot for sense to maximize usage for all terminals. If it were a loop it would be the same number of stops from Blue to A going either direction and would actually be one extra to reach B. I think a loop is not really helpful here. Also, having transit riders on one end and car users on the other provides some natural load balancing. In addition to what Equilibria said, I believe the plan is to relocate the ferry terminal for downtown/Hingham/Hull/(new Seaport route? ), which should also make the ferry a much more attractive option. Moving the Water Transportation next to that proposed Intermodal Transportation Center would not only be a boon to ridership from Logan, but also probably an increase among residents of Jeffries Point in East Boston. The ferry terminal now is impractically far away from where Eastie residents would walk/bike to. It'll probably be better organization for water taxi service and the Wynn Encore water shuttle as well! All that said, I bet it'll be an environmental nightmare (i.e. NEPA and MEPA) to move water transportation service there. The area in question has a very big tide differential. Does anyone feel that the APM will make the Blue Line more attractive for people to get to/from Logan? Not if it requires a fare like pretty much every other airport-transit APM connection in the country. JFk and Newark charge $5.50 btw. Does anyone know if it will? The proposed design makes charging that impossible, so it appears that is not the intention. - The transit connection point is the same stop as the economy garage, so you can't charge the fare at the point of getting into the APM unless you were also going to charge the economy garage people. Which you aren't. - The Airport T stop does not exclusively serve the airport, so you can't add an extra charge to use the fare gates at the Blue Line. - East Boston is certainly not going to allow their on-foot access to the airport or the airport T stop to be cut off, made inconvenient, or charged extra, so any attempt to charge people at a point going between the Blue Line and the APM will be easily circumvented by whatever routes people from East Boston would take to access either. I'll also note a large portion of the push for this is to encourage more transit use to the airport and lower the % of car trips. Charging for use of the APM would be the exact opposite of that. And that the current Blue Line transit connection (shuttle buses) are free would further drive up opposition, as you aren't implementing a new thing that doesn't exist, you're replacing free with a cost. I think youre right. The key is that the 100% idiotic FAA rules is that you can only use airport money for airport purposes, and they consider parking an airport purpose but a train station (even if only used for the airport) as not an airport purpose. By combining the blue line stop with the garage stop, they are able to use the airport money. You mean that after all these year, Masspork has finally decided to put in a people Mover?!! Like Ricky would say; This, I gotta see!! Huh? The NYC airports charge, but SFO, ORD, MIA, and LAX either don't or won't. OAK charges a ton, but that connector was built by BART, not by the airport. The JFK and OAK trains also go well off airport property to reach transit lines miles away. Atlanta's airport does not charge a fare for their APM that connects to the rental car facility. Last edited by mass88; 02-05-2019 at 12:38 PM. I'd imagine that the APM would eliminate the need for a number of the existing buses, which as we all know are free to use. Getting rid of those buses would represent some major financial savings which would offset the cost of the APM, allowing the APM to potentially be free as well. Not just buses, but drivers. Not sure how the maintenance costs compare, but the operating cost is likely way lower. I have never been to an airport in this country that charges for terminal serving APM. There are APM systems that charge for connection between airport and another, significantly more remote destination, such as the AirTrain at JFK. But Dallas, Atlanta, Oralndo, just to name a few do not have a charge for in airport transportation, which is what this proposal would be. It would be a really, really good thing if the intermodal stop included an easy way to get to the water modes. If you buy a NJT ticket with "EWR" as your destination, the $5.50 fee is included. Thats why the ticket costs $5.50 more than if you buy Newark Penn, which is in the same travel zone. The machines sell monorail tickets for folks who try and avoid the fee by buying Newark Penn tickets and then cant get past the fare gates. Uber and Lyft clogging San Francisco Airport. Worse than taxis, because they're loitering at the curb. Average of 27,500 pickups and dropoffs every day. This can be fixed: airport car entry fee and drop zone controls. SFO is just whiffing on their admin responsibility. SFO (and OAK) have a $6 surcharge on all BART trips. That makes it ~$11 to get to downtown SF, and ~$15 to get to Oakland, from SFO; from OAK it's not much less. And BART wonders why they're lagging on ridership on the airport extensions.